Looking over last year’s April Bloom Day post, I see the same things blooming at pretty much the same time. The smaller-and-earlier species crocus are on the wane, but the later-and-larger Dutch crocus are definitely making a color statement. I’m thinking about getting more of these and extending the crocus bank further towards the road and maybe wrapping around. I don’t have to make up my mind now, but I need to take a picture of the area in question, print it out, and mark exactly where I want them to go, because if I do choose to plant more, I’ll need some way to remember where they currently end. 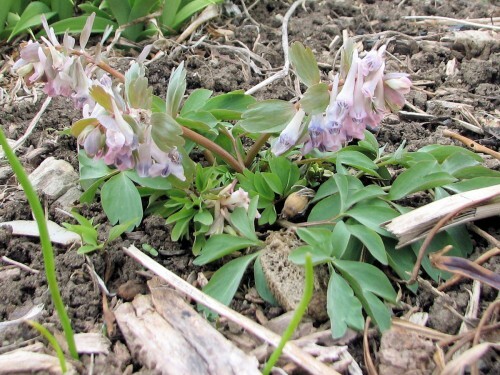 These Siberian squills have self-sown. I planted these Siberian squills at the base of a dry-stacked stone wall, and they are thriving, multiplying by seed as well as by bulb. 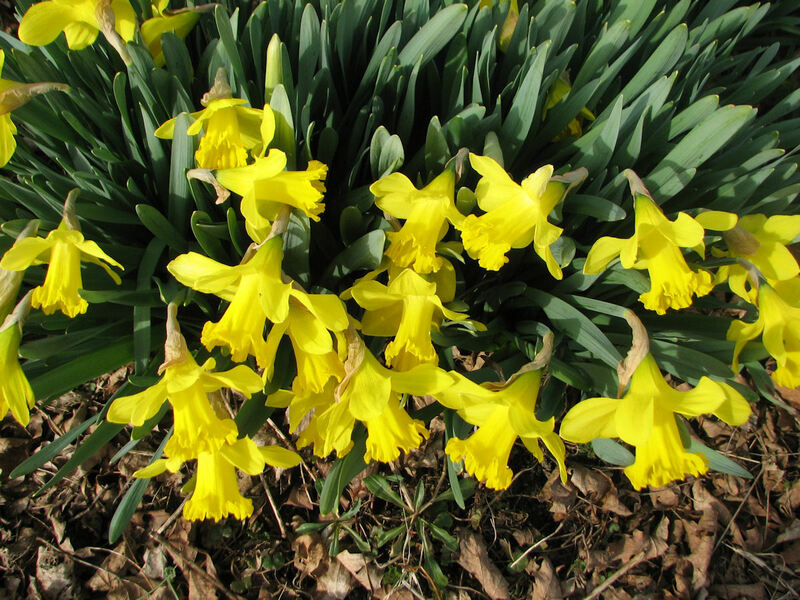 The earliest daffodils are blooming, but there are plenty more to come. This particular clump came from bulbs that were already growing here, and I lifted them and divided them. I have no idea what variety they are. This pink corydalis is larger than last year, but the color seems more washed out than last year. Maybe that 16F night we had earlier in the week changed the color. 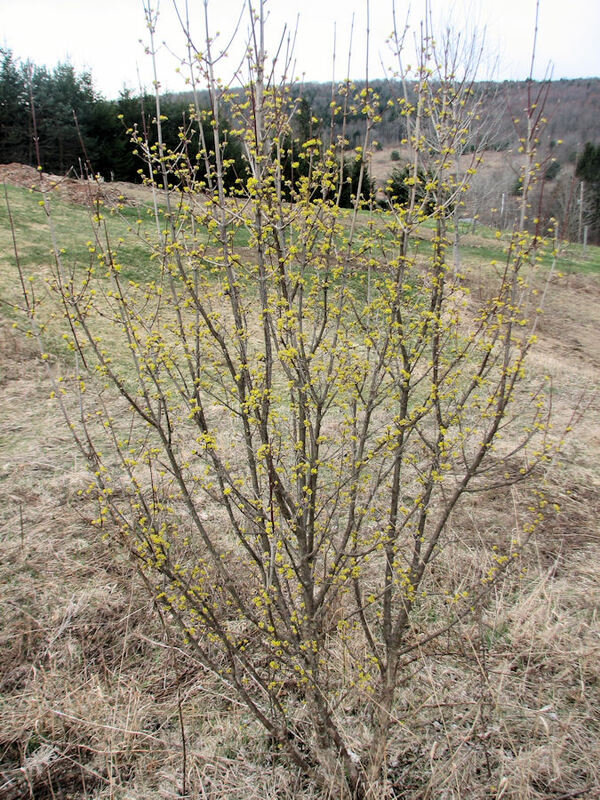 This ‘Spring Glow’ cornelian cherry seems to have a more upright habit than others I’ve seen. It is in full bud, but most of the individual florets are not yet open, just like last year. This is Hepatica nobilis. I bought it from Seneca Hill Perennials with the unremarkable name of Mixed Blues. There is actually more of a violet cast to the flowers; they are not quite as blue as the photo makes them appear, but they definitely are dramatic. When I ordered this one, I mistakenly thought it was the native species. 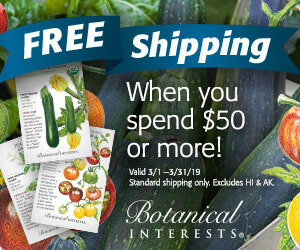 It’s not, but it’s still a great plant for the early spring garden. Save some seed for me. I also really love the picture on the upper right hand corner of the swath of daffodils. Sometimes I really miss living in WI where spring bulbs stole the show! Oh, your bank of crocuses glowing in the sun is GLORIOUS! I can’t remember for sure if I was just leaning over the crocuses to get the picture, or if I was laying on the grass. I think I was actually just leaning over them, but holding the camera down low so that you get a straight-on view. I took quite a few pictures of them from this close-in perspective, trying to show the swathe of beautiful blooms in a way that makes it feel like you’re looking at them up close. I always look forward to the crocuses blooming, and we all always take pictures of them every year, but to me they seemed especially striking and beautiful this year. They’re especially beautiful when the late afternoon sunshine is slanting down and shining through them. I tried to take pictures so that you could see all the colors of the blooms extending downward, giving you the feeling of lots and lots of crocuses blooming, but also so that you can see them up close in detail as well. I fiddled around with the manual focus on my camera to get that effect–nothing carefully calculated, mind you, I’m not good at that, just making the focus range go up and down to what looked about right. If I get around to it, I’ll post more of the crocus photos on my Flickr account. 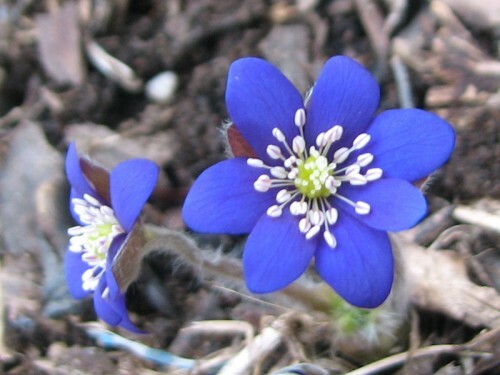 You sure saved the best for last… that Hepatica is a beautiful flower. And I like Annie’s idea of using golf tees to mark where spring flowers are blooming. I might try that. I love Hepatica. That one is just beautiful. And the crocus shot is truly wonderful! There IS nothing like spring flowers, is there? 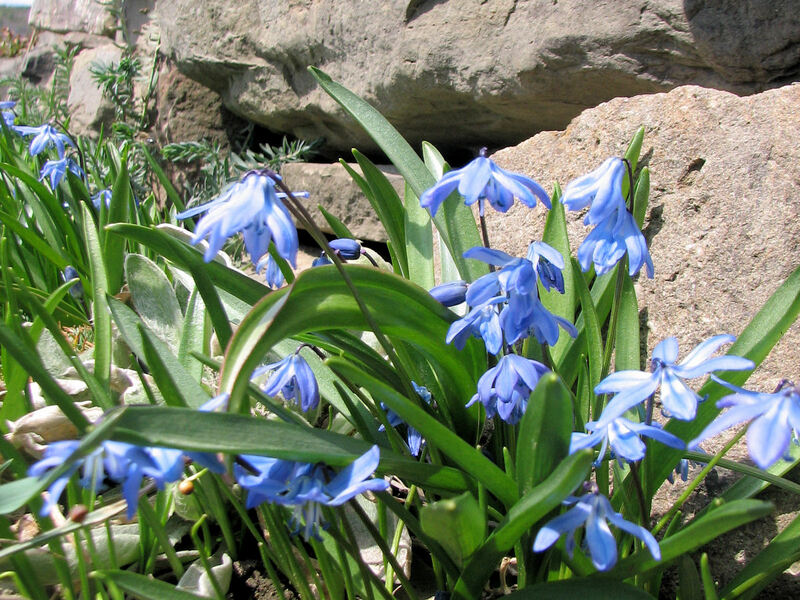 I have a special weakness for the scillas – my mom used to have lots. I’ll have to make a note to plant some in the fall. I’m with all the rest of them, I LOVE that hepatica. I am wondering how it would do down here in the miserable frying heat of August, though? I might try it anyway. 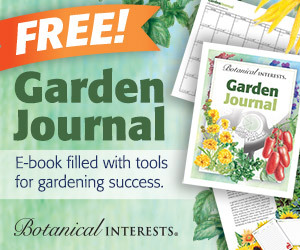 What I like best about GBBD is the opportunity to see what is going on elsewhere in the gardening world. Your crocus bank is delicious. I have one too, but not nearly so well populated. The squirrels think the corms are a delicacy. Wow, the hepatica is beautiful! I’ve never seen anything like that. A big “Yes” to what everyone else is saying about that Hepatica! And I love the drift of crocus. I wish I had room for that. 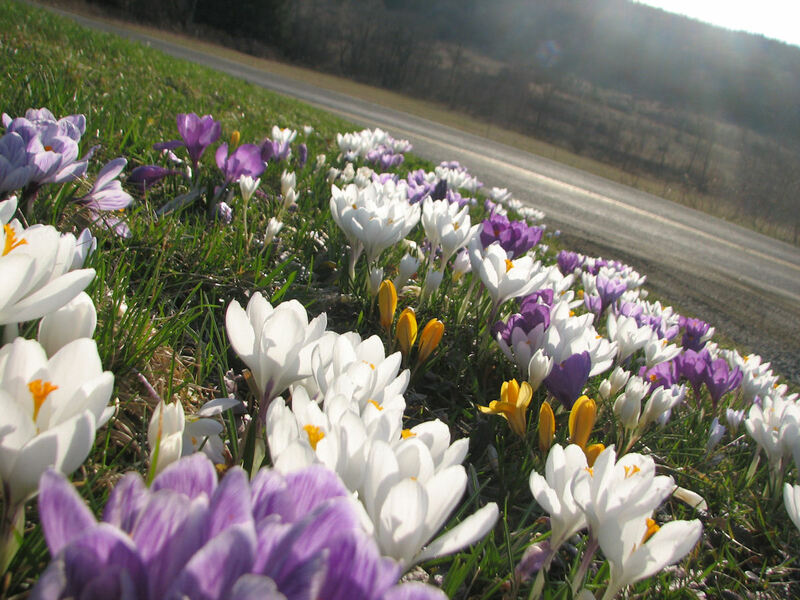 love the hill of crocuses (crocii?)! mine are sparsely scattered, and need to be put in one spot, I think. and love love love the new Hepatica!!! wow. I’m wondering if you should extend that Crocus bank – I’d hate for you to get sued by people who crashed their cars while mesmerized by it. ;^D That Hepatica is just a stunner. I sure hope I didn’t get any drool on my new laptop. I just love that crocus bank! What a wonderful swath of color! That Hepatica looks fake almost- the colors are so striking! Just beautiful! I think I may just have to look for that :). The first photo, on the crocus, just jumped off the screen at me- great photos! Kathy, You have answered my Bloom Day question: do scilla’s self seed? I have some blooming amidst dense weeds and they surely were never planted anywhere near there. I thought it was a beautiful mystery. thanks for the solution. Kathy, I’m swooning over the Scilla AND the Hepatica … oh, to be able to grow those! Cindy, they are both such tiny blooms, too. I wish I had included a coin in the photo to show the scale. The shimmery boss of stamens on the Hepatica are utterly charming, but the self-sown Scilla is the flower I miss. Did you ever try using different colors of golf tees as markers for your bulbs? You push them in so you can mow over them but still find them with your hand when fall planting time arrives. I’ve only had moderate success with this idea but it’s cheap to try. I just might try the golf tees. I’d read that tip before, but had forgotten it. Thanks for the reminder, Annie. Crocus’ are so pretty and that last photo is to die for!! Darla’s last blog post..GBBD 15th of the Month! Outstanding photo of the crocus. And yup, hepatica is sensational! The Hepatica is stunning! thanks for the tweet. Amazing. My mind boggles. Emma, thanks for stopping by. I hope to check out your blog later on today.